We know very little about Antonio De Feo in terms of where he was born, when, when did he arrive in America, etc. 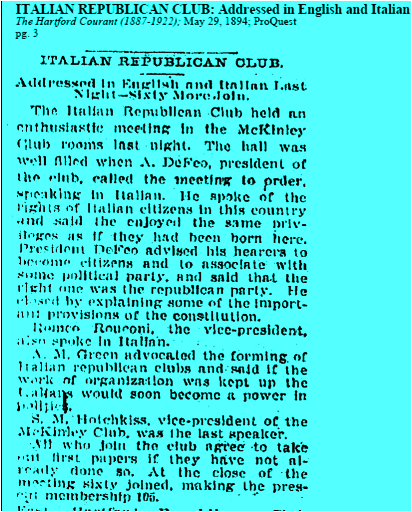 We first encounter him in 1894 as chairman of the Italian Rpublican Club of Hartford, a position he uses to advance the civil rights of Italians by opposing the Padrone system and by encouraging Italians to become citizens and voting! He testified before the CT State Legislature in 1895 and did convince them to pass legislation abolishing the Padrone system, a process thru which a boss would hire group of workers for a job while collecting a fee plus more and sometimes disappearing with the immigrant's money while leaving them without work. 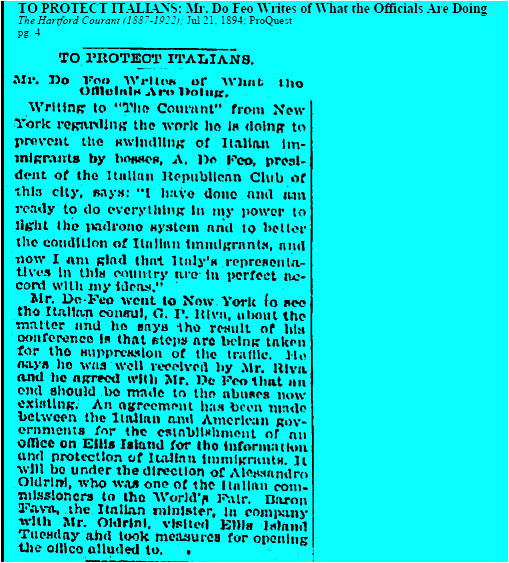 We lose track of him in 1904 when in the last reference we can find he is mentioned as work8ing for the newspaper Heral Italian of NYC.